Ronnie Davis is a long way from his home in Orlando, Florida. A freshman at Benedictine University, Lisle, Illinois, Davis has his sights set on a career in accounting, his major. “I’m pretty good with numbers,” he says. “I like numbers, and I like a challenge. So, I felt like that was a nice challenge to go for.” After college, Davis hopes to return to the Orlando area, get valuable experience working for an accounting firm and eventually, open his own accounting firm. Another reason he chose Benedictine was the CIC/UPS Scholarship through ACI. That meant leaving his family – not an easy choice, he says — so he could pursue his dreams. “I come from a single-parent home. I have five other siblings. It was like, ‘I need everything I can get in a scholarship.’ I related to the scholarship so that’s what made it easier for me to put my heart and soul into everything to make sure I got that scholarship,” says Davis, who says his family is a strong support for him. The CIC/UPS Scholarship made a big difference, making it possible for Davis to pay tuition bills so that he could register for new classes. “The scholarship lifted the hold, so I could register for my classes, and fulfill the rest of my classes here at Benedictine,” he says. Without it, Davis says he would have had to take out another loan. Davis is grateful for the donors who made the scholarship possible. “College is a burden. But with the donor’s help, it makes it easier for us. They’re helping us to do what we want to do, that we dream of doing. So, I would like to thank them,” he says. Originally from the Democratic Republic of Congo, Gracia Neema’s family settled in Galesburg, Illinois, where she grew up. She wanted to attend a small college close to home and chose Quincy University, Quincy, Illinois, where she is planning a career as a pediatrician, majoring in biology with a minor in chemistry. Neema was inspired to become a doctor by her own pediatrician and her mother, who wanted to be a pediatrician but became an accountant instead. “I kind of want to do it for her. My pediatrician when I was a child was very nice, very helpful, very calming. I like helping people. I like kids, especially,” she says. “I want to be able to go back to my country in Africa and build a hospital and maybe a school next to it,” Neema says. “I also want to practice somewhere here in Illinois at first and try to go to med school or P.A. school in-state, too.” Neema says the hospital she wants to build will focus foremost on patient care. 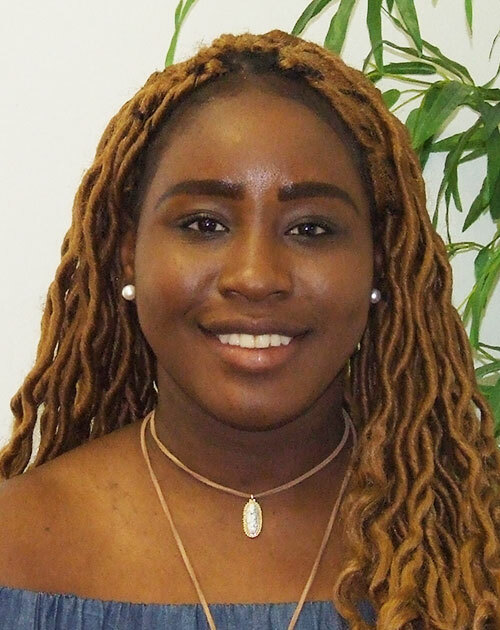 The A. Montgomery Ward Foundation scholarship has helped Neema pay for tuition expenses at Quincy. “Being from a family of five, it really helps my family to know that’s a couple of hundred more dollars off that they don’t have to worry about,” she says. Neema has other scholarships to pay for tuition and is thankful for donors who make the scholarships possible. She hopes one day to provide scholarships for future students. “We really do appreciate it,” she says. Neema is involved in a variety of activities at Quincy University. She participates in the Black Student Union, Quincy University Special Olympics, is a multicultural ambassador, a resident assistant and is participates in the Campus Activity Board. She is also in chemistry club and a Connect Mentor, serving as an ambassador for the school.